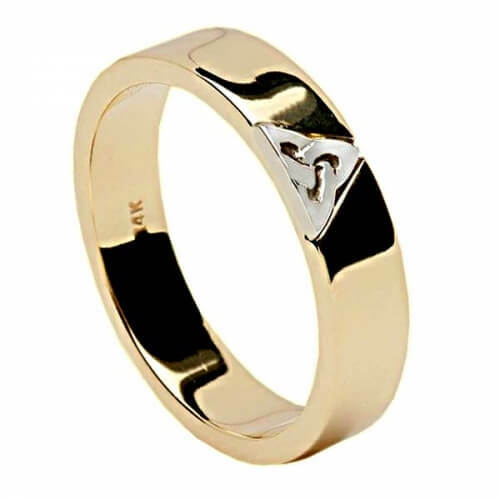 This 14 carat gold Trinity knot ring is equally suitable for a man as a woman. This is a solid ring with the evocative white gold Trinity knot showing clearly against the yellow gold background. 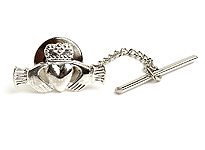 Hallmarked by the Dublin Assays Office. 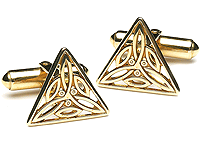 The Trinity knot is said to represent three Celtic goddesses or the Holy Trinity. 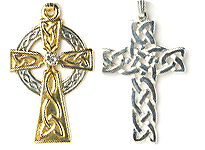 Handcrafted by Irish artisans, this classic Celtic design is a very popular favorite. Delivered in a luxury presentation box. 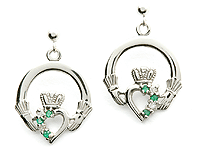 Service rating : We bought two rings,they arrived within the specified time and looked exactly like the pictures. We're really pleased with them and have had many nice comments. 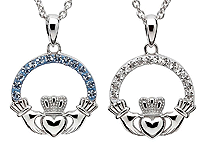 Product : The rings are really lovely and they came within the time specified, exactly what we were looking for. Product : The ring's design is lovely, the edges of the ring are not rounded so it can be a bit sharp if caught at an angle. 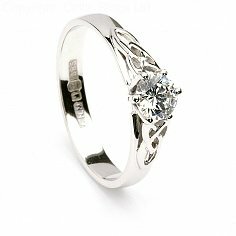 Service rating : Abeautiful ring I love it, I am Celtic myself and enjoy wearing it. Product : A good looking ring. I am enjoying wearing it. Service rating : Le produit livré n'est pas tout à fait conforme au besoin exprimé. La taille de la bague livrée est du 10.5 au lieu de 10. Le service de livraison est conforme. A voir pour la durée dans le temps. En tout cas une première impression très bonne ! Service rating : Excellent Service. Great looking ring. Product : Excellent service. Great looking ring. Les bagues sont très belles, présentées dans un joli écrain double. Arrivées très rapidement. Il nous tarde de les porter. Service rating : Alles lief zu unserer vollkommensten Zufriedenheit, die Bestellabwicklung lief einwandfrei, die Lieferung erfolgte sogar früher als wir gedacht hatten, wir wurden per SMS immer auf dem Laufenden gehalten, und die Ringe entsprechen der Beschreibung und der Abbildung im Online-Shop und haben exakt die richtige Größe! Danke für Ihren Service, gerne kommen wir wieder auf Sie zurück! Service rating : Geen opmerkingen. Duidelijke website en snelle levering. Product : Precies zoals op de website en duidelijke hulp bij de maat. Service rating : Beautiful ring, great quality, and excellent customer service. Very prompt at answering questions. Thank you! Product : Love the ring! Thank you so much! Service rating : The rings were what we wonted. They came in a timely mater. Were completely satisfied. Product : They were perfect just what we wonted. Service rating : Ordering the ring online was easy and there was no delay in receiving the ring. Service rating : I am very happy with my received ring and the customer service along the process. 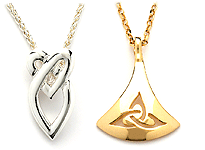 Product : It is exactly the product as described on line and looks even better in real. Service rating : I ordered the wrong ring size, and the company mailed me a new one with the right size just days later. Vincent Byrne kept in contact with me through email and took me through every step of the process. Product : It is a beautiful wedding ring! Service rating : Prompt and courteous service made the buying experience simple and enjoyable. And the ring is exactly as pictured and described on the site. Beautiful. I would most certainly purchase through Celtic Wedding Rings again. Product : The ring is beautiful and is exactly as pictured and described on the site. Service rating : Terrific CS, I received several emails confirming size and requesting date needed by. I git the ring ahead if my deadline and perfectly packaged. Would recommend them highly, beautifully crafted! Fantastic! Most helpful checking in before our final order to confirm sizes. Service rating : Ring is beautiful as always!